Read this post to find the list of affordable Search Engine Optimization Services and tools that will help you to increase your site ranking. Search engine optimization is an integral part for every blogger that can never be neglected when optimizing the website to rank at the top of the search result. Optimizing a website for search engines not only means making a friendly site that is easy to navigate or writing high quality contents. Until and unless the proper techniques are not used you cannot achieve the goals to rank your blog at the top of the search result. There are several terms and techniques that you need to consider to optimize your site such as keyword research, building backlinks, on page and off page seo and several other terms. As you know that seo is a deep sea that need adequate amount of skill to swim in it and therefore in order to provide certain level of comfort for bloggers and webmasters there are several affordable search engine optimization services and tools to optimize your site by automatically doing the hard jobs such as finding perfect keyword for your blog, finding the keyword competition, suggesting the less competitive keyword and many other jobs. Read: Why You should never buy backlinks? I know that Search engine Optimization (SEO) do not require any investment because there are several free tools out there in internet such as Google adword for keyword research, majestic seo to check the backlinks and mozbar for chrome to find the page and domain authority of your competitor but as you know that if you start doing these jobs by your own it may take several hours for you to find a perfect and less competitive keyword however if you use any of the paid tools you can complete your SEO job within few minutes. I am not saying you to buy these tools, I am just recommending you to give it a try until the trial period is over. After that if you found these services useful just buy one of the affordable Search Engine Optimization Services and tools that fits your need and requirement. As the name suggest Long tail pro helps you to find the long tail keyword without any extra efforts. Long tail pro not only facilitates you for keyword research, it will also help you to find the keyword competition and the extent to which it is possible to rank in the search result by providing the keyword competition score based on the site title, page authority, page links, domain authority, mozRank, page rank and site age. As a result by analyzing the competition score you can determine the possibility of getting ranked. Although Long tail pro is an affordable Search Engine Optimization one time investment profitable tool for keyword research but in order to get facility of keyword competition you need to buy the platinum version by paying extra $17 per month. For more detail of long tail pro plans I have mentioned the comparison table below. SemRush is another great tool that helps to analyze the competitors along with the collection of 106 million keywords with about 100 million domains including AdWords ad copies and positions, organic positions for domains and landing URLs, search volumes, CPC, competition, number of results, and so much more. Although semrush is not an affordable search engine optimization tool but its usefulness come along with its price. Semrush is a website based tool that helps you to analyze your competitors keywords in which they are ranking at top position as well as it will also help you for mining the less competitive keyword with high search volume. In simple words it is just a perfect keyword research tool with extra useful features that also analyze your competitors keywords just by entering their domain name. Let’s take an example with real scenerio, lets assume that I want to know the keywords of warriorforum.com for which it is ranking at top results of search engine. In order to find the keyword of warriorforum I will just type its url in the search box and with in few seconds I will retrive the list of thousands of keywords warriorforum is ranking for. Therefore guys just by entering your competitors domain name you can grab their keyword and you can even try to rank for that keyword just by writing more useful content. As I have already mentioned that Semrush is not an affordable search engine optimization tool because its basic package starts at $69.95 / month and therefore I only prefer you to use it in its 1 day trial period which you can get just by verifying your phone number or by sharing about semrush in social networking profile. 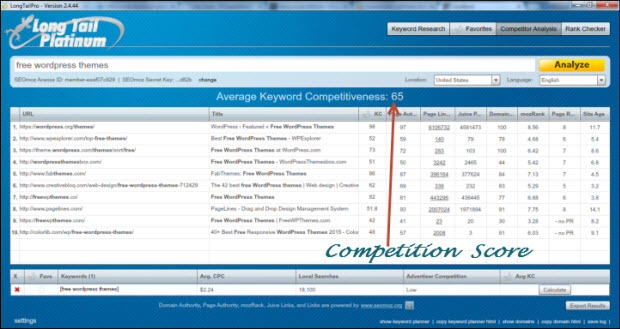 After that if you love this tool you can buy its premium subscription to mine extra keyword or to analyze your competitors keywords. As you know that backlinks are the crucial factors that matters a lot in terms of your site SEO because more the backlinks pointing to your site represents that search engine will trust your site more than with less backlinks. And therefore Ahrefs is a versatile backlink discovery tool that can determine each link pointing to your site. As I have already mentioned above that ahrefs can determine your backlinks but by using this tool you can even determine your competitors backlinks which will help you a lot in terms of SEO. By using this tool you can determine the rough figure of your site trustworthiness and you can even estimate the links that you need to build. Click here to learn more about ahrefs. So, guys these are the list of affordable search engine optimization tools that will help you a lot in the journey of SEO. If you find this post useful then please comment below and share it with other budding bloggers. Thanks a lot for your information.I signed in and liked semrush so much.